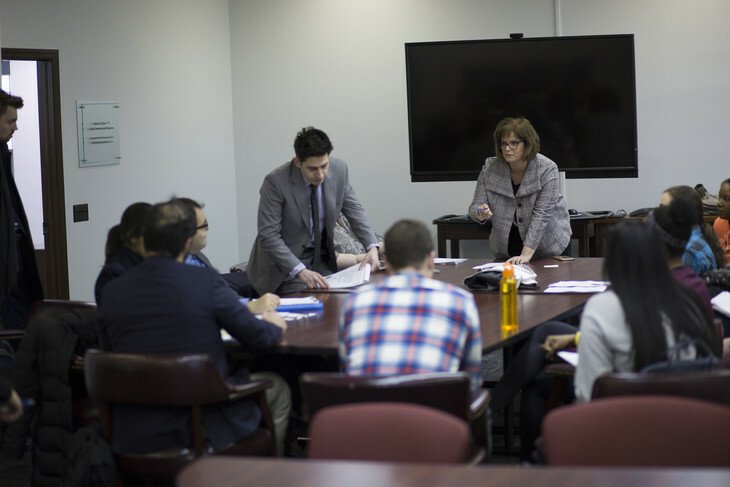 Professor of Clinical Law Lucy Johnston-Walsh debriefs with Dickinson Law students and child and adolescent psychiatric fellows from Penn State Health Milton S. Hershey Medical Center following a mock hearing. As part of a joint exercise with Penn State Dickinson Law, child and adolescent psychiatric fellows from Penn State Children’s Hospital recently participated in a mock hearing. The hearing, which was designed around psychiatric issues in a custody dispute, provided law students the opportunity to practice examining expert witnesses and fellows the opportunity to practice giving expert courtroom testimony.